Generation Z have an average of seven devices and prioritise high speed Wi-Fi over meals and laundry facilities when choosing accommodation, reveals new StudentCom research. 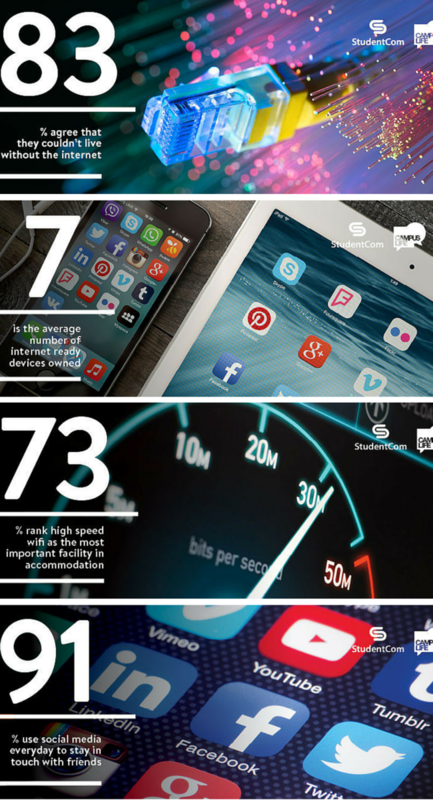 Over 73% of the 15 to 18 year-olds questioned ranked fast Internet connection above an onsite gym, a double bed and modern facilities, with almost half saying it was the most important accommodation facility. The independent research conducted by StudentCom, an innovative broadband solutions provider, also revealed that 92% of young people own a smart phone, with a further 57% using a tablet on a daily basis. Tom White, Marketing Director at StudentCom, comments: “Around three in five prospective students worry that university accommodation won’t have the technology facilities they need – these statistics are really revealing and highlight Generation Z’s priorities; given August is only a few months away it’s important that universities, colleges and private accommodation providers alike take this into consideration as part of their offering. To download the StudentCom whitepaper or access the research videos, please visit the StudentCom website. Get ready for Bett 2019, where you can touch and see the latest edtech!